The Bur's Blessing is a feature that unlocks to players level 20+. 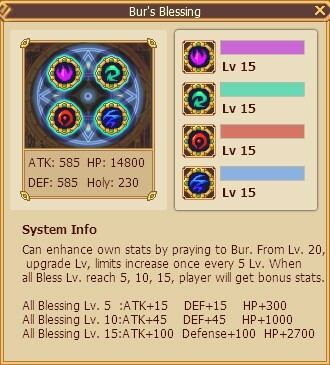 This feature allows players to enhance their stats by praying to Bur. The Bur's Blessing can be purchased from the market and players will receive bonus stats based on the Bliss levels. Additional stats are awarded at Bliss levels 5, 10 and 15.